Krishna jayanthi (கிருஷ்ண ஜெயந்தி) or the birth of Lord Krishna is celebrated on ‘Ashtami’ (அஷ்டமி) day of ‘Aavani’ (ஆவணி), the 5th month of Tamil calendar. In Tamil Nadu, Janmashtami is celebrated by making various sweets and savories at home and praying to Lord Krishna. In the villages, ‘uriadi’ (உறியடி) is conducted for the young men to break the butter containing pot hung at a height. This game is a delight to watch. On this auspicious day, let us pray for the peace and well being of all those living in this world! A sweet recipe is in order for this special day. Wheat rava payasam is an easy-to-make recipe that is delicious to taste. *As you are using condensed milk, less sugar is needed for making this payasam. However, you may add more sugar if you so desire. Method: Wash wheat rava well, add ¾ tumbler (150ml) of water and cook in a pressure cooker for 5 minutes (5 whistles). Such small quantities can be cooked along with rice. Once the pressure subsides, remove from the cooker and keep aside. Boil milk in a kadai or thick bottomed vessel, add cooked wheat rava, sugar and condensed milk. Mix well and bring it to boil. Switch off the stove. Powder cardamom seeds, add cardamom powder and clove to the payasam and mix well. Heat the ghee in a spice pan/ tadka pan (தாளிக்கிற கரண்டி). Fry cashew nuts and raisins till the nuts turn light brown in color. Add the fried items to the payasam. Serve hot either as part of a meal or as a dessert. If you like this post, please share it with your friends, followers or contacts, by just clicking the 'Face book', 'Twitter' or 'Google +’ icons you see below the post. Feel free to post your comment/ feedback. Your support is greatly appreciated. Thank you! 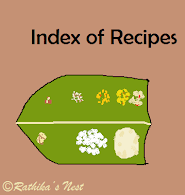 Click on the image to view more than 395 recipes! Copyright © 2014 rathikasnest.com. All rights reserved. Picture Window theme. Powered by Blogger.